DACONO, Colo. -- Chris Eggleston has made it clear that he's in the championship fight for the NASCAR K&N Pro Series West title. For the second straight race, the 28-year-old from Erie, Colorado, won the Coors Light Pole Award and then pulled away from the field en route to the checkered flag. Saturday night, the win came at Eggleston's home track of Colorado National Speedway in the NAPA/Toyota 150. "I didn't feel like we had the winning race car there in the early goings," Eggleston said in Victory Lane. "The No. 16 (Gilliland) kinda got out front, checked out, and was holding a pretty good race pace a little bit. I did everything I could to keep up with him without abusing the tires. And our car wasn't really good firing off on short run speed, but it really had a lot of long run speed." Eggleston's No. 99 Platinum NAPA Filters Toyota led a Bill McAnally Racing sweep of the top three spots -- he was followed across the finish line by runner-up Derek Kraus and championship points leader Todd Gilliland -- for his third win in the last four series races at the .375-mile oval just miles from his hometown. "Once we checked out and got single file, I didn't think there was going to be that much grip on the top in (Turns) One and Two," said Eggleston, who pulled away for a win by .767 seconds following a retart with 14 to go. "It's just predominantly lost grip the last couple years, and we kind of tested the waters out there midway through the race. I thought we found some speed, and it helped me conserve tires more than anything running up there and it kind of saved us. "Hats off to everybody at Bill McAnally Racing, NAPA Auto Parts; three wins in s season, that's the best we've ever done and we're just hopefully going to build on that and keep chipping away on that 16's lead." Gracin Raz finished fourth, followed by rookie Kody Vanderwal. Julia Landauer, Ron Norman, Michael Self, rookie Will Rodgers and Todd Souza rounded out the top 10. The NAPA/Toyota 150 will air on NBCSN on Thursday, June 15 at 7 p.m. ET. 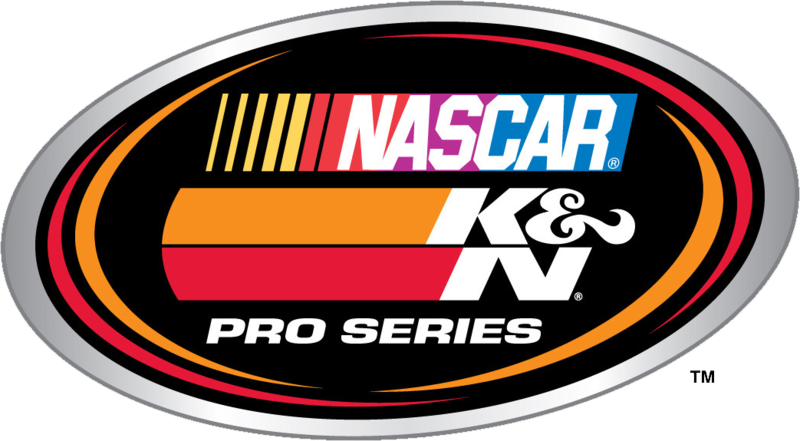 The K&N Pro Series has a weekend off before heading to the road course, with the Carneros 200 at Sonoma Raceway. 1. (1) Chris Eggleston, Erie, Colo., Toyota, 150 laps, 47.526 mph. 2. (2) Derek Kraus, Stratford, Wis., Toyota, 150. 3. (3) Todd Gilliland, Sherrils Ford, N.C., Toyota, 150. 4. (13) Gracin Raz, Lake Oswego, Ore., Ford, 150. 5. (11) Kody Vanderwal, LaSalle, Colo, Ford, 150. 6. (6) Julia Landauer, New York, N.Y., Ford, 150. 7. (5) Ron Norman, Tucson, Ariz., Chevrolet, 150. 8. (4) Michael Self, Park City, UT, Ford, 150. 9. (9) Will Rodgers, Solvang, Calif., Ford, 150. 10. (10) Todd Souza, Watsonville, Calif., Toyota, 150. 11. (12) Matt Levin, Tucson, Ariz., Chevrolet, 150. 12. (17) Dan Phillippi, Los Angeles, Calif., Ford, 150. 13. (18) Rich DeLong III, Santa Clarita, Calif., Chevrolet, 150. 14. (19) Jesse Iwuji, Carrolton, Texas, Chevrolet, 149. 15. (15) Rudy Vanderwal, LaSalle, Colo, Chevrolet, 147. 16. (14) Takuma Koga, Nagoya, Japan, Chevrolet, 145. 17. (8) Nicole Behar, Spokane, WA, Toyota, 142, radiator. 18. (21) John Wood, Eagle, ID, Chevrolet, 141. 19. (16) Stafford Smith, Eagle, Idaho., Ford, 139. 20. (7) Blaine Perkins, Bakersfield, Calif., Chevrolet, 93. 21. (20) Bill Kann, Scottsdale, Ariz., Toyota, 76, accident. Caution Flags: 9 for 49 laps. Lead Changes: 10 among 3 drivers. Lap Leaders: C. Eggleston 1-11; T. Gilliland 12-75; C. Eggleston 76; T. Gilliland 77-85; C. Eggleston 86; T. Gilliland 87-92; C. Eggleston 93; T. Gilliland 94-99; C. Eggleston 100-136; D. Kraus 137; C. Eggleston 138-150. Standings: 1. T. Gilliland, 316; 2. C. Eggleston, 309; 3. D. Kraus, 260; 4. K. Vanderwal, 243; 5. W. Rodgers, 242; 6. N. Behar, 239; 7. J. Landauer, 236; 8. M. Self, 231; 9. T. Souza, 230; 10. M. Levin, 228. Brandon Carlson of Victoria, British Columba, Canada finished third, Bob Presley of Olympia and Seattle’s Molly Helmuth rounded out the top five. The evening started with Shane Mitchell setting the fast qualifying time of 13.534 on the 3/8th mile oval. With a roll of the dice, Mitchell landed an 8-car invert for the feature event. Rod Schultz Sr. and Brandon Carlson would lead the field to green. You could feel the electricity rolling through the grandstands as Schultz Sr., took the early lead from Carlson and 18 year old Brittney Zamora. Zamora, who graduated from high school with honors earlier in the day, quickly took the third position. By lap 60, Zamora, one of four female starters, had taken over 2nd from Carlson, whose car had gotten very loose. Zamora kept pressure on Schultz Sr. trying to take the lead position. His experience and knowledge allowed him to keep the track to his advantage. By lap 100, Mitchell had taken over the 2nd position and both he and Zamora pressured Schultz Sr. for the lead, while trading 2nd and 3rd back and forth between them. Both drivers tried the inside and the outside to no avail. At lap 123, Mitchell finally got a nose inside Schultz Sr., who tried to close the door going down the front stretch. The glowing red brake rotors on Mitchell’s car indicated he was trying to get slowed up, but contact was made and Schultz Sr. headed straight for the turn one wall, collecting Zamora in the process. Zamora drove to the pit area to pull out some body panels and change a tire. Schultz Sr. left on a rollback, and Mitchell was posted for the contact as per the rules. Kleyn, a two-time runner up in the series standings, becomes the only driver to compete in every event with the series since its inception. It’s not very often that you have more than one female racer competing at an event. South Sound Speedway race fans witnessed four young ladies in the running at the Rumble in Rochester 125. All series regulars, Brittney Zamora finished 10th, Brooke Schimmel finished 7th, Stephanie Evans finished 16th. Molly Helmuth was the highest finishing female running 5th. 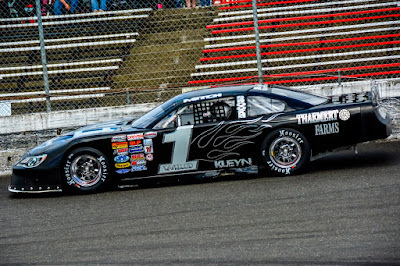 Brittney Zamora leaves South Sound Speedway as the northwest’s first female super late model point leader. The next event for the NWSLMS is at Douglas County Speedway in Roseburg, Oregon on June 17, 2017 at http://www.douglascountyspeedway.com. Lap leaders: 1- 123 Rod Schultz Sr., 124-125 Mitch Kleyn. DAYTONA BEACH, Fla. — Chris Eggleston hopes a return home will help him continue building momentum in the NASCAR K&N Pro Series West. The series heads to Colorado National Speedway in Dacono, Colorado, on Saturday, June 10 for the NAPA/Toyota 150. The 2015 series champion chipped into his points deficit at California’s Orange Show Speedway in the series’ most recent event, earning his first Coors Light Pole Award of the season en route to the victory, putting him within 11 points of the K&N Pro Series West points leader and Bill McAnally Racing teammate Todd Gilliland. Eggleston’s victory was his second of the season — but it was his first since the season opener at Arizona's Tucson Raceway — and it snapped Gilliland’s dominant run of four straight wins. Eggleston, who is from Erie, Colorado, just eight miles down the road from the .375-mile oval, returns to his home track where he’s a multi-time Legends track champion and a multi-time Super Late Model feature winner. His first two career NASCAR K&N Pro Series starts came at Colorado National Speedway, the second of which he won after qualifying third in 2014. In his four career starts at Colorado National, Eggleston has two wins, three top fives and an average finishing position of fourth. As the series hits the halfway mark of the season, Eggleston finds himself in prime position to inch closer to a second K&N Pro Series West title. EVENT SCHEDULE: Saturday, June 10 - Garage opens: 11:30 a.m.; Practice: 2:45-3:30 p.m.; Final Practice: 4:15-5:05 p.m.; Driver/Crew Chief Meeting: 5:15 p.m.; Qualifying: 6 p.m.; Autograph Session: 7:30 p.m.; Driver Introductions: 8:15 p.m.; NAPA/Toyota 150: 8:30 p.m. The Race: The NAPA/Toyota 150 will be the seventh of 14 races on the 2017 NASCAR K&N Pro Series West schedule. The Procedure: The maximum starting field is 22 cars, including provisionals. The first 18 cars will secure starting positions based on the group qualifying process. The remaining four spots will be awarded through the provisional process. The race will be 150 laps covering 56.25 miles. The Track: A .375-mile asphalt oval, the track features four degrees of banking on the straights and progressive banking of six to 12 degrees in the corners. Race Winners: There have been 11 different winners in the 14 previous K&N Pro Series West races held at Colorado National. Mike Duncan, Eric Holmes and Chris Eggleston each have two wins at the track. Pole Winners: In the 14 previous events at Orange Show, there have been 12 different pole winners. Eric Holmes and Dylan Kwasniewski each won two poles at the track. Looking To Rebound: Most teams in the garage would be happy to qualify fourth and finish sixth after leading a handful of laps, taking their finish and looking to build on it. But for point leader and defending NASCAR K&N Pro Series West champion Todd Gilliland, that exact effort at California’s Orange Show Speedway marked the worst outing of the year for the 17-year-old Sherrills Ford, North Carolina, driver — snapping an historic four-race winning streak. In fact, the sixth-place finish was Gilliland’s worst since finishing eighth in the 2016 season finale. Fear not Gilliland fans, by finishing sixth, Gilliland extended his streak of top-10 finishes to 14 straight dating back to a 24th-place finish nearly one full year ago at Sonoma. With four wins, five top fives and six top 10s in six races this season — including the first five poles of the year — Gilliland still leads Eggleston by 11 points atop the series standings with eight races remaining. Up Front: Qualifying has been key over the course of history at Colorado National Speedway. Eleven consecutive winners have come from inside the top three on the starting grid. In 12 of the 14 K&N Pro Series West races in history at the track, the winner started inside the top three. Four winners came from the pole position, while five event winners started on the outside of the front row. No driver has started worse than 14th — Steve Portenga in 2001 — and gone on to win at Colorado National Speedway. Mike Chase won the inaugural series race at the track in 1995 from the ninth starting position. Self Taught: For the first time this season, Michael Self finds himself inside the top 10 in the NASCAR K&N Pro Series West standings. Self, who missed the first race of the season, finished eighth at Orange Show for his fifth straight top-10 finish. The Park City, Utah, driver has six career wins and finished a career-high of fourth in the 2013 standings. In four career starts at Colorado, Self has three top 10s and a best finish of fourth in 2012. Quiet Charge: Nicole Behar has been quietly stringing together an impressive return to the NASCAR K&N Pro Series West. After running only a handful of races last season, Behar’s family-owned team has five top 10s through six races this season and ranks fourth in the overall standings. Only Gilliland and Eggleston, the top two drivers in the standings, have more top 10s than Behar this season. Behar, of Spokane, Washington, opened the year with five straight top 10s, including a season-best finish of fourth at Irwindale, and was running inside the top 10 again before a crash ended her night early in the most recent run at Orange Show. In her only career start at Colorado, Behar finished ninth. 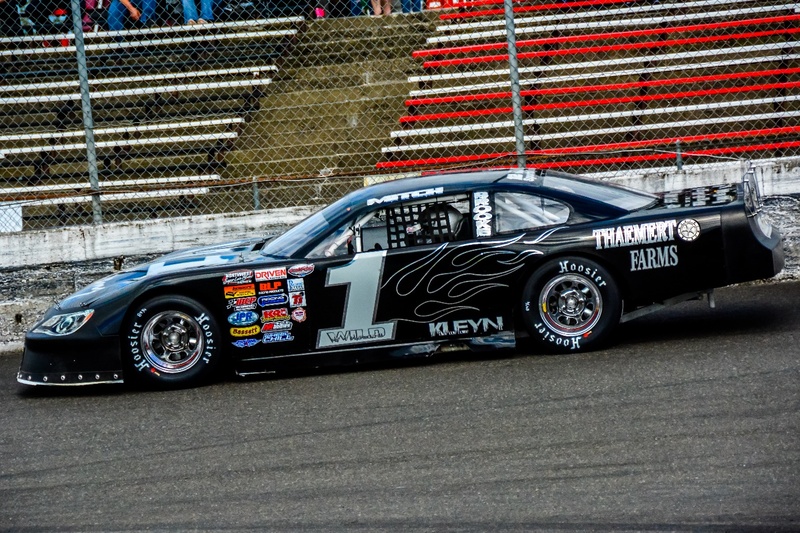 A NASCAR Whelen All-American Series track featuring the Super Late Model division as its premier division, the Pro Trucks and Super Stocks join the NASCAR K&N Pro Series West on the schedule this weekend.